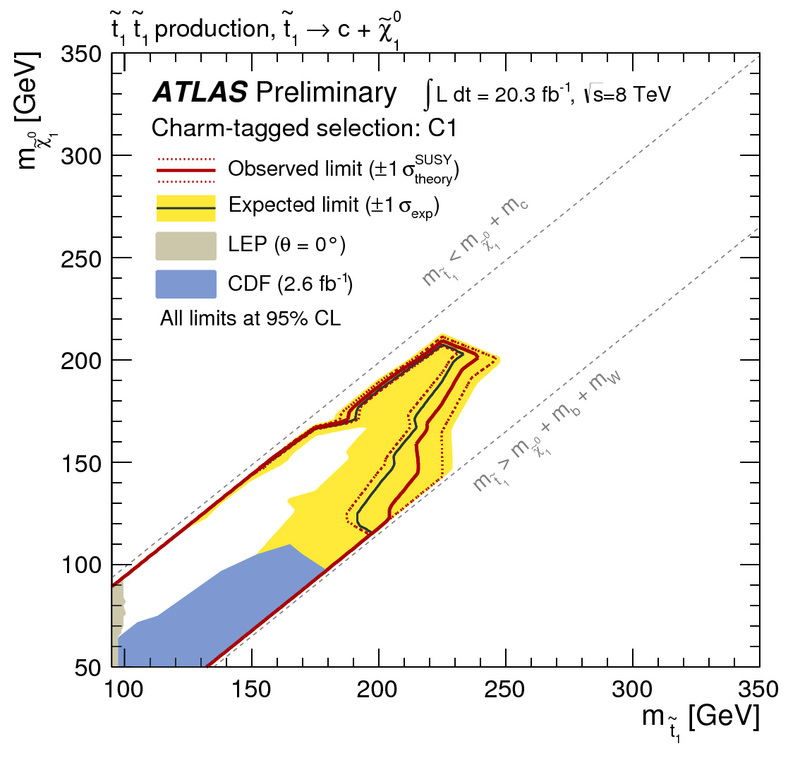 The figure shows the range of masses for the hypothetical SUSY particles stop and neutralino that has been studied by the new ATLAS analysis explicitly identifying decays involving charm quarks. Combinations of stop and neutralino masses within the red line are now excluded by the new results. Results obtained previously at the Tevatron, and from LEP experiments at CERN, are shown for comparison. ATLAS today presented new searches for Supersymmetry, a theory that could explain the large amount of dark matter in the universe. For the first time, a search for the SUSY partner of the top quark -- the stop -- in its decay to charm quarks was presented. Certain SUSY scenarios predict decays involving charm quarks to be dominant, so identifying the charm quarks explicitly increases our ability to see these processes happen, or, as in this case, put a limit on their existence. Another analysis targets a scenario involving hypothetical SUSY particles called charginos which may live long enough to travel a significant distance inside the detector before they decay. Note the 'charge' in chargino -- these particles would carry electric charge and hence leave signals in ATLAS' tracking devices -- until they suddenly disappear. Thanks to its unique Transition Radiation Tracker, ATLAS is particularly well-equipped for this study. No signal has been observed, again putting stringent limits on the existence of such long-lived particles. Many other searches for new physics, such as a direct search for dark matter in association with a W boson and a search for new gauge bosons decaying to tau-leptons, were also presented. ATLAS physicists are currently presenting new results at the biennial Europhysics conference on High Energy Physics. The week-long conference, which is taking place in Stockholm, Sweden, is organized by the High Energy and Particle Physics Division of the European Physical Society (EPS). Various new ATLAS results are being presented, including studies in B physics, precision measurements of the Top quark, searches for Supersymmetry and other Exotic physics models, as well as refined measurements of the properties of the Higgs boson, with many results now based on the full 2012 data set. EPS-HEP is one of the major international conferences in the field of high energy physics, with more than 700 participants.